WELCOME, Students! Research Help is here for you! Welcome, Students! As the semester begins and due dates for your research assignments and projects approach, see what assistance (and time savings) a research librarian can offer you! Librarians can help you: brainstorm and refine your research topic, locate scholarly research, materials, and/or data, help you cite information, and much more! Feature Films on the Main Floor! Notice the new round shelving right in the middle of the Main Floor Study Area? It’s loaded with Feature Film DVDs! The Digital Media Lab in Milne Library, a collaboration between CIT and Milne, had a very successful inaugural year. This past summer, the DML moved to a new location in Milne to meet the growing needs of the campus community and to give users an even better experience. 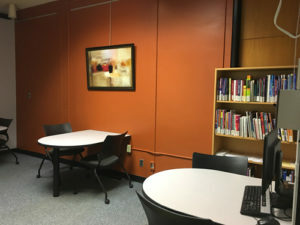 The renovated DML now occupies the former location of the Center for Academic Excellence, an enclosed area with more space, on the library’s main level next to the new office of Dave Parfitt (Director of the Teaching and Learning Center). The DML was created to give students a place to design and create exciting media projects for their classes and to support faculty as they continue to expand their use of instructional technologies. The lab is open during the same hours as the library; professional staff and students are available to help the Geneseo campus community with their digital media needs through consultations and workshops. Several types of media equipment (video cameras, portable hard disk drives, etc.) are available for signout at the service desk. 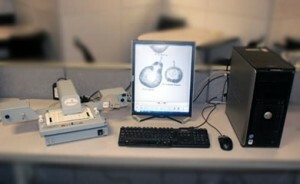 More information about the Digital Media Lab, along with a list of equipment for signout, can be found at http://www.geneseo.edu/dml. Gone are the days of bringing coins to Milne Library or asking for change at the service desk in order to use the copy machines in Milne. New for the start of the Fall 2012 semester, students, staff and faculty will be able to use the copiers in Milne simply by entering their SUNY Geneseo username and password on a touch screen display or by passing their SUNY Geneseo ID cards in front of an attached card reader. Cost of the copies will be automatically deducted from their printer balance. Lower Floor: black & white copier located along the wall between the Microforms and Indexes & Guides. Main Floor: color/black & white copier located in the study area. 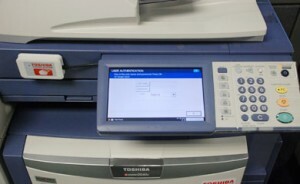 This copier automatically detects whether you are printing color or black and white and charges the appropriate amount. Upper Floor: black & white copier located in the new Census and Data Demographics Data room. Community guests will have access to the copiers too. They will need to stop at the Service Desk in Milne so a staff member can get them logged in to the copier. If you have been hesitant to view and scan microform (microfilm, microfiche & microcard) because of big, bulky equipment, hesitate no more. 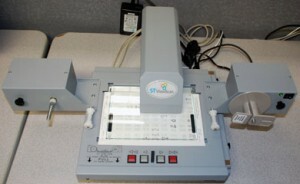 Milne Library has replaced its large microform readers/scanners with two state-of- the-art, all-digital ST ViewScan scanners, giving users greater flexibility in how they scan microform. These scanners, located on the lower level, are fast and produce excellent high quality scans. The scanners are equipped with their own MS Windows software that is easy to use so you can get the exact scan you need, plus the ability to easily save your scans (right to your Google Drive, if you like). Stop in soon and give one a try — you won’t be disappointed. What once was Milne Library’s Writing & Learning Center – consisting of AOP tutoring services, the satellite center for the English Department’s Writing Learning Center, ELL tutoring and speech buddies program and the Geneseo Testing Center – has officially been renamed to better represent the many helpful services offered in the center. Welcome to the Milne Center for Academic Excellence! Beginning in January 2012, the English Department’s Writing Learning Center shifted all operations to Milne’s location, supplementing its evening and weekend drop-in hours with regularly scheduled appointments Monday-Friday from 1-5 pm, which had traditionally taken place in Welles Hall. 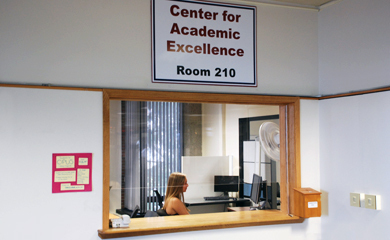 The Center for Academic Excellence received a new facelift over the winter break as well – new carpeting, a glass panel in the front window, and potentially glass doors to separate the two rooms within the center – all in an effort to make the space comfortable and conducive to studying and testing. 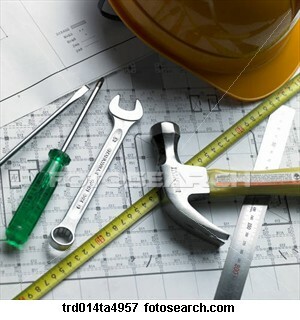 Information regarding the services offered in the center can be found at a newly designed and comprehensive website. 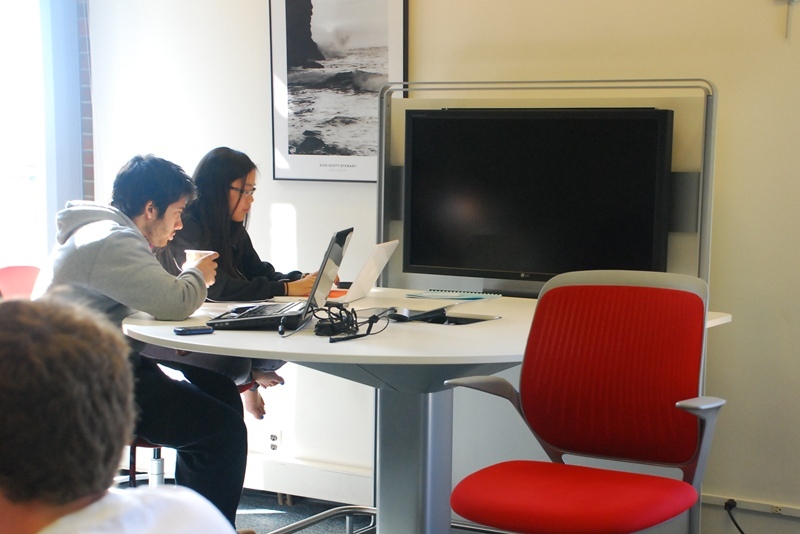 You may have already noticed, but in case you haven’t … a new, big, shiny collaboration station has been added (on a trial basis) to the glassed-in study area on the Library’s main floor. Designed by Steelcase Furniture, which specializes in business and educational solutions, the MediaScape station can accomodate up to six different laptop computers simultaneously, and it’s easy to switch among them to display on the large flat-screen monitor. With so many papers and projects coming due this month, students working in groups should find this new workspace a timely addition. Hurry in and give the MediaScape a whirl — we’re trying to gauge student interest in it before mid-April, when the trial ends. When you stepped into Milne Library this semester, did you notice something missing? Three of our librarians are retiring, having logged their last days at Milne before the year’s end. They represent, collectively, 100 years of exeperience at SUNY Geneseo — Barbara Clarke, the Head of Milne’s Teacher Education Resource Center, retiring after 35 years here; Paul MacLean, Head of Information Technology Services, 31 years; and Diane Johnson, Head of Serials, 34 years. Donna Howe, Secretary to the Library Director, also retired last semester but has returned to Milne on a part-time basis until May. Be assured that, while Barbara, Paul and Diane and all their excellent work will be missed, the folks at Milne are endeavoring to transition as smoothly as possible and will continue to provide the same high level of service our users expect and appreciate. To read more about these librarians’ careers and retirement plans, see the front-page article of the Fall 2010 Milne Library Infobits . As anyone who has visited Milne Library (or this blog) during the p ast month already knows, the folks here were very busy this summer making improvements to everything from the Writing Learning Center to IDS to the new Service Desk. For a neat little overview, click here to watch a student-produced video highlighting these changes. Over the summer, additional study tables were added to the Periodical Area on Milne’s lower level. The space was freed up after a reorganization of the print periodical collections that included integrating 11,000 Milne periodicals and 6,000 Holcomb periodicals into the Fraser Periodical Storage Area. 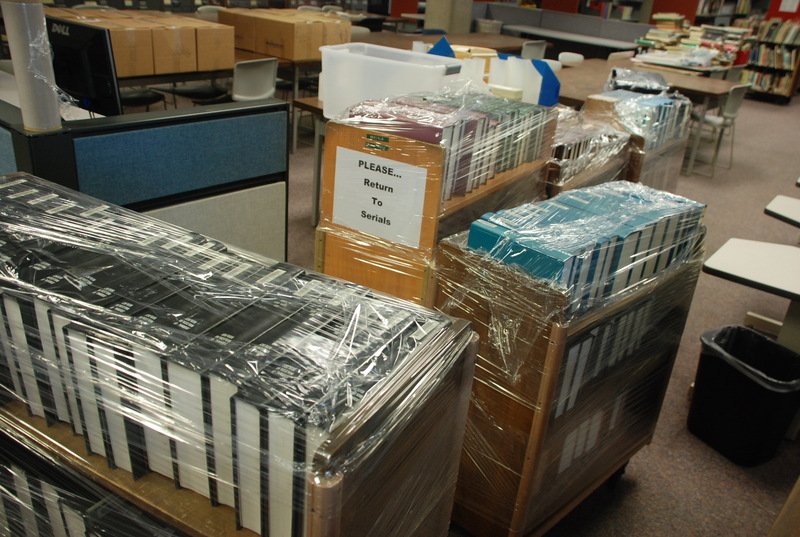 The migration of many of our journals to an online format means that much of our print collection does not need to be readily accessible and can be housed elsewhere on campus. Patrons can request retrieval of stored material by filling out an IDS request form.